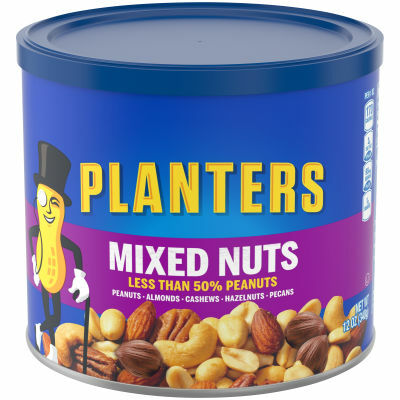 Planters Mixed Nuts feature a perfect combination of peanuts, almonds, cashews, hazelnuts and pecans, salted with sea salt to enhance the unique flavor of each of these delicious nuts. - A good source of fiber, these mixed nuts are also kosher friendly. Available in a convenient resealable 12 oz. canister, you can enjoy this tasty mixture time and time again as a versatile snack or ingredient in your favorite desserts.